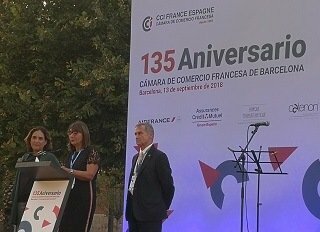 The 135th anniversary of the French Chamber of Commerce and Industry of Barcelona, with which the EU Mediterrani collaborates closely, was held on Thursday, September 13 at the Sant Pau Hospital in Barcelona in the presence of the new President of the Chamber, Mrs. Paule Celma, its director Mr. Philippe Saman and the mayor of Barcelona Ada Colau. The Chamber of Commerce promotes synergy between companies on both sides of the Pyrenees and provides linguistic and professional opportunities to our students. From the Mediterrani community we congratulate the Chamber for the success of this great event.